lt;stronggt;EXCRCMTR3HCPlt;/stronggt;lt;BR/gt;Ex-cell Metro Collection Recycling Receptaclelt;BR/gt;This durable recycling center is as visually stunning as it is functional. Easy-to-remove interchangeable tops cater to specific workplace needs. Fire-safe steel construction with rigid plastic liner. Transfer decals include plastic squeegee for easy application and designations for trash, paper, plastic and cans/bottles. Use with Planter Kit sold separately to create a waste receptacle, recycling receptacle and planter all in one. Heavy-duty feet elevate container for air circulation and restrict floor discoloration. 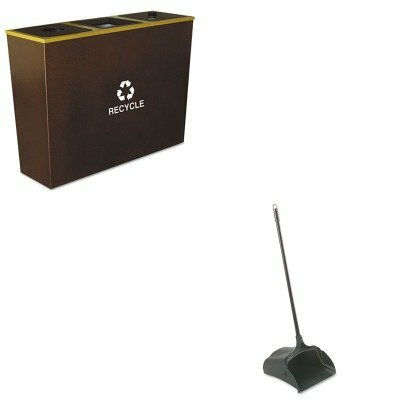 Waste Receptacle Type: Recycling Materials: Steel Application: Recycling Capacity Volume: 54 gal.lt;BR/gt;lt;BR/gt;lt;stronggt;RCP253100BKlt;/stronggt;lt;BR/gt;Ex-cell Metro Collection Recycling Receptaclelt;BR/gt;Wheeled, vinyl-coated dust pan with superior durability and ergonomic safety features. Yoke and handle assembly with larger, stronger and quieter hinge pins. Durable wheels and wear pads on back of pan extend product life. Built-in handle on back of pan lets you empty without touching pan bottom. Ideal for use in malls, restaurants and lobbies. Will not stain, discolor or absorb odors. Materials: Polypropylene with Vinyl Coated Steel Handle Width: 12 1/2amp;quot;. If you have any questions about this product by excell, contact us by completing and submitting the form below. If you are looking for a specif part number, please include it with your message.